As part of Zero Waste Week I wanted to explore Reuse in the context of “unavoidable waste”. I’m not talking about far-fetched ideas for reusing waste from a once-in-a-blue-moon item; rather how to squeeze something useful out of leftovers that are a function of our healthy, routine habits. Why? Even when I take every effort to avoid plastics and unnecessary packaging, I still create incidental “waste”. Toilet rolls are a classic example. Toilet roll tubes and their wrapping are incidental but common waste products. Whilst some people may give up loo paper completely (and, I know, many cultures barely use it at all), for many, including me, that’s a non-starter. So can these items usefully be deployed to meet a real routine need? I’ve already mentioned toilet rolls tubes this week in connection with my leeks. In spring and summer I also use them for seedlings in addition to my plug trays, especially for plants that have a long root run or don’t like root disturbance like sweet peas, cornflowers and root vegetables. Once the tubes have fulfilled these secondary uses, they go onto the compost heap as carbon material. Whilst we always have more tubes than I can Reuse, squeezing a second use out of many of them is very gratifying, solves a practical need and saves a few pounds in the process. What about the packaging toilet rolls come in? That went into the bin as black bag waste, as our small ‘convenience’ supermarkets don’t take back plastic bags. From now on though, I may use a tip I picked up this week. Open the package carefully and use it as a kitchen bin liner. As Mr M still insists on lining our tiny waste caddy, I may just adopt that idea! What about inevitable food waste? To what extent can this be reused? Vegetables scraps can be used when boiling up stock, and citrus pith and skin make excellent candied peel, which has nothing in common with the sickly chewy substance that comes in plastic tubs! I rarely peel potatoes but when I do, I sauté the skins in a little oil and spices to make homemade crisps… The scope for Reusing scraps is almost endless. 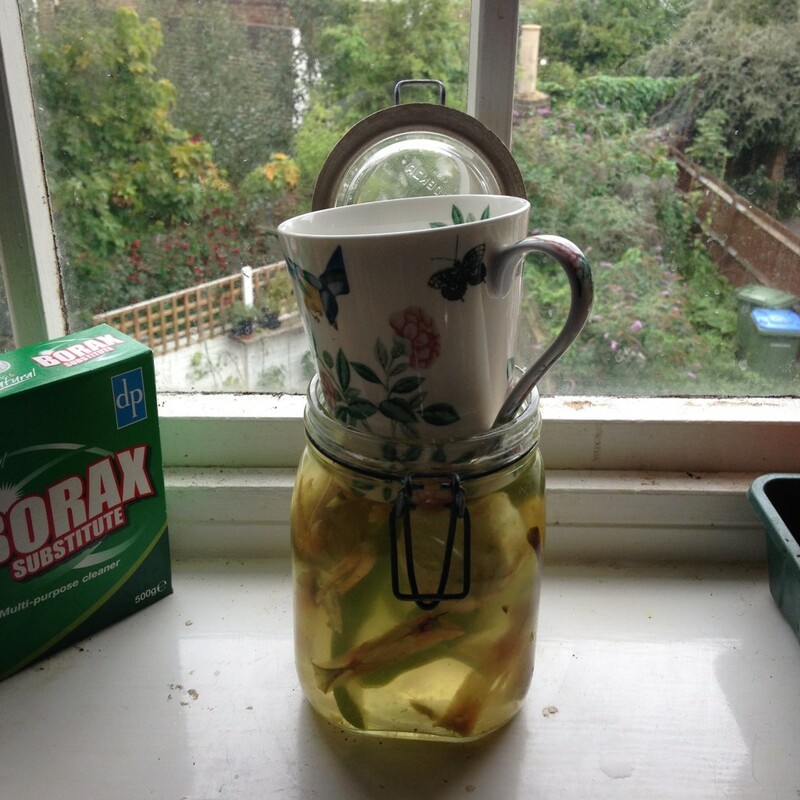 Lindsay over at Treading My Own Path shared ten examples of food #Reuse this week. I’d like to add a couple of my own. As it is preserving season, I have been using more apples than normal. The core and skins could go straight on the compost but recently, I have been giving them an extra lease of life. Inspired by @zerowastechef and @jackiemania I have started to make scrap vinegar, which has numerous uses around the house from cleaner to fabric and hair conditioner. 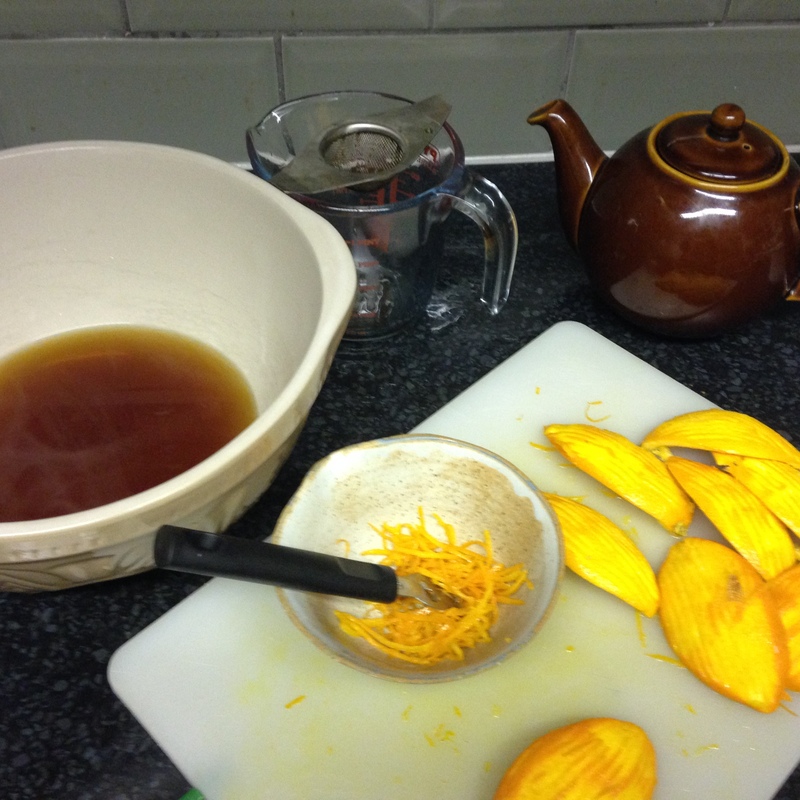 For a recipe check out this post by the ever-inspiring Anne Marie. The most common “waste” product in my kitchen is probably tea. Although I slashed my tea intake last year, I am still left with a lot of spent tea leaves. I end up composting these but I have been experimenting with ways of getting more utility out of them before I let them rot down. 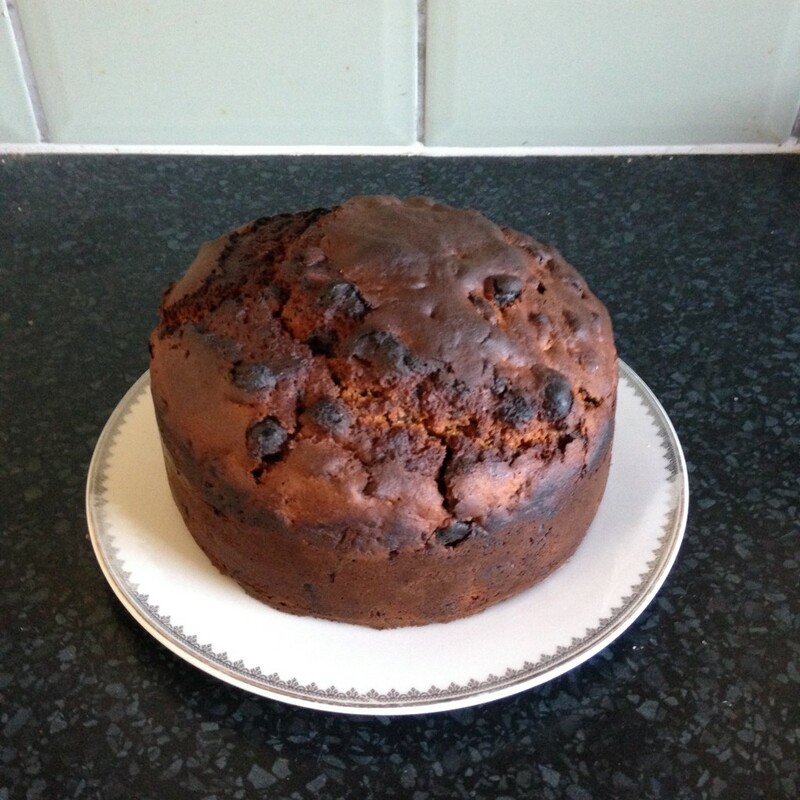 One of my favourite is that classic Irish cake: barm brack. In essence, it is as fruit cake but a really thrifty one. Simply collect the tea leaves of the day and use them to brew up a strong pot of tea (about 2/3 of a pint or 375ml). Strain it off. Soak 10oz or 250g of sultanas/raisins, a handful of candied peel or the zest of a large orange and 6oz or 150-160g of dark brown sugar in the tea overnight. You can add a good teaspoon of mixed spice too for an extra hearty cake. Next morning the dried fruit should be plump and the sugar dissolved. If any tea has not been absorbed, pour off half. Then simply sieve in 10oz of plain flour with two teaspoons of baking powder (not bicarbonate of soda/baking soda) and beat in one egg. Combine well (adding a little of the reserved tea if the batter is hard to work) and pour the batter into a well-greased baking tin (round or loaf shape). Bake for 1 ½ to 1 ¾ hours at 180C/350F/Gas Mark 4. Like many fruitcakes it is the perfect snack for a dark, damp autumn day. It is firm enough to pack for long walk but moist enough so it won’t dry out. And because it doesn’t contain any fat, it seems to last longer in an airtight container than many cakes. And finally, to prove that not all Reuse involves time and effort, in recent months I have taken to removing the tea leaves from the pot after brewing a cup of tea and making a second and third pot from the same tea leaves. Yes, the brew is weaker but it works perfectly well, especially without milk, and tastes infinitely better than most decaffeinated teas I’ve tried! This post was inspired by Zero Waste Week and its them of Reuse. The campaign runs for one week but zero waste efforts continue throughout the year, not just in casa Mrs M but amongst a growing community of waste avoiders. Check out #zerowasteweek on Twitter or Instagram or sign up to the Zero Waste Heroes Facebook Group for ongoing inspiration. And if you think waste avoidance efforts go unnoticed, think again! I have just heard that an Early Day Motion was proposed in the House of Commons (the lower chamber of Parliament) to celebrate Zero Waste Week. I’ll write more about this in my reflections on Zero Waste Week, but suffice it to say: grassroots concern and action about waste are being noticed and society’s attitude to waste, including food waste, is steadily changing! We are just in time for apple season too! I just got my first local apples. I made my apple scrap vinegar last apple season, and I’m just using the last few teaspoons of it — the timing is now perfect to make more.